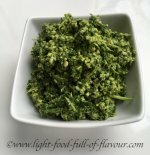 I want to show that it is possible to make savoury jams without loads of sugar. This is an incredibly tasty sweet chilli sauce - made with very little sugar. I am forever trying to either eliminate, or at least reduce, sugar used in savoury food. At times I cannot understand why it has even been added to a recipe. Other times I find that you can get an absolutely delicious result with just a tiny bit of sugar, or honey – as is the case in this Not-So-Sweet Chilli Sauce. I only added two teaspoons of honey to start with (I use raw, untreated honey) but ended up adding two teaspoons of soft brown sugar as well. Though compare that to 150g of sugar used in other recipes like this. 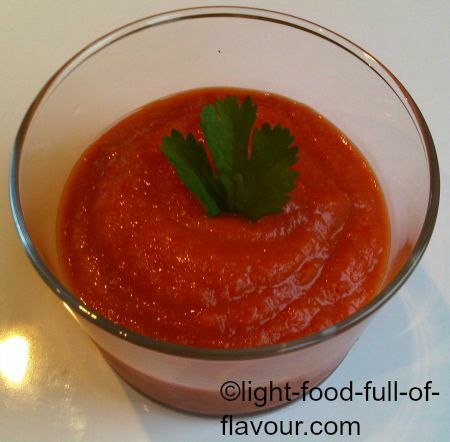 This chilli sauce is simply stunningly tasty and such a versatile thing to have to hand - any left-overs can be frozen. I smother some over salmon fillets and bake the salmon in the oven. Or I add some to fried scallops, or falafels to name but a few things. You could add it to a stir-fry as well - either a vegetable stir-fry or one where you also add thinly sliced chicken, or prawns. I tend to blend it to a smooth sauce, but you could just as well leave the sauce as it is once it has cooked. 1. Add the oil, onion, chilli and ginger to a sauce pan and cook over a medium heat for about 4 minutes, stirring every now and then. 2. Add the remaining ingredients, bring to a simmer and stir until the sugar has dissolved. Leave to simmer for 35-40 minutes, until it’s quite thick and most of the liquid has evaporated. Check the seasoning - you might want to add some more fish sauce, or some salt. 3. Remove from the heat and cool down to room temperature. Either leave it as it is, or use either a stick blender or a food processor/blender to mix until you get a smooth sauce. This sauce will easily keep for several days if it’s covered and kept in the fridge.